The newly formed Drugs and Health Alliance are not the only ones to be calling for a complete rethink on drug strategy. This week they called for policy to be removed from the Home Office and planted where a public health focus could take root (page 4). It’s easy to be blinded by new documents and deafened by calls for this and that at the moment, but it’s crucial that we feed into new drug strategy as actively and constructively as we can. The new alliance has drawn together diverse partners, some who temporarily abandoned their traditional lobbying posts to be at the launch. They wanted to make the point that, political differences aside, they share the goal of robust debate on any new drug strategy. There was plenty of dissent from the 2005 Drugs Act when it appeared, coupled with accusations that the field had not been properly consulted. With plenty of warning that the ten-year drug strategy expires next year, it seems entirely logical to try to influence policymakers with the weight of experience. We’ve seen the aftermath of enforced change on our letters page, since the magazine began. Please take the chance to contribute ideas, or respond to some of the articles we’ll be running over forthcoming issues, examining ideas for new strategy. Active debate will surely be healthy for the quality of our services. With changes to ring-fenced drug funding threatened, active service user involvement will be more important than ever. 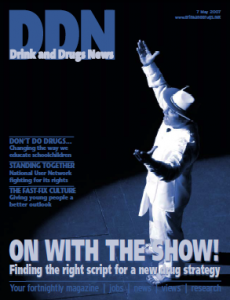 Talking to the National User Network, better known as NUN, revealed that they are shaping up to a force to be reckoned with (page 8). Catching up with Kevan Martin of the alcohol service users’ network NERAF (page 9), gave useful tips on how to use a ‘softly softly’ approach to get impressive results in representing service users – and it’s extremely encouraging to see how far Kevan’s efforts have taken him over the past year.